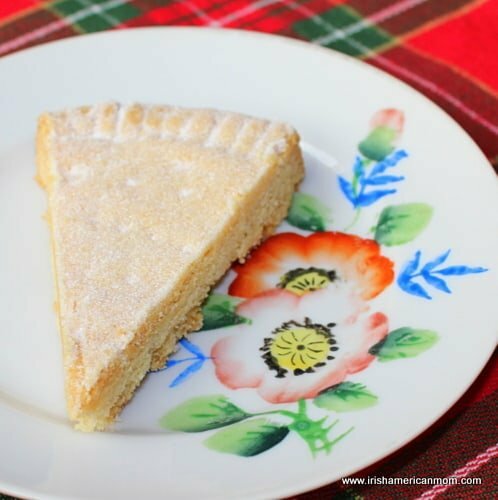 Shortbread is originally from Scotland, but like many tasty Gaelic treats, Irish people have shared a love of shortbread with their Scottish neighbors for centuries. And the best shortbread in the world is baked with creamy butter made from grass fed cows such as Irish Kerrygold butter. Shortbread biscuits are simple at first glance – butter, sugar and flour are the three basic ingredients. But trust me, getting the exact balance and ratio is key to baking success. Shortbread can be flavored anyway you choose – lemon and thyme, chocolate and orange or even with more exotic flavors like lavendar or caraway. 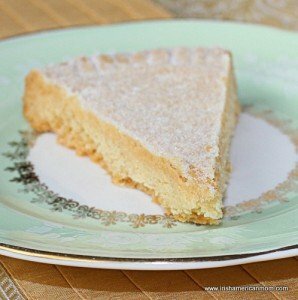 For me however, the best shortbread in the world is just plain and buttery, with a sprinkle of sugar on top. With Christmas just around the corner and cookie swaps getting into full swing, I thought it might be the perfect time to share my recipe for shortbread. So today is the day for Petticoat Tails. 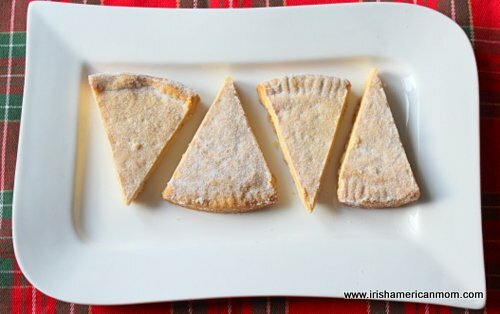 This unusual name is given to shortbread cut into triangles and decorated to resemble petticoats from days gone by. From the 12th century onwards women wore elaborate petticoats beneath their skirts, with decorative, frilly layers peeping below their skirts. In Dublin Castle the dining hall was fitted out with low lying petticoat mirrors. When a lady sat down to dine she could inspect her skirts in the opposite mirror to ensure her ankles were fully covered by the voluminous layers of her petticoats. In the 18th and 19th centuries Irish girls wore red woolen petticoats beneath their skirts. In some parts of the country custom required them to switch to blue or purple petticoats once married. And don’t get me started on “petticoat government”. 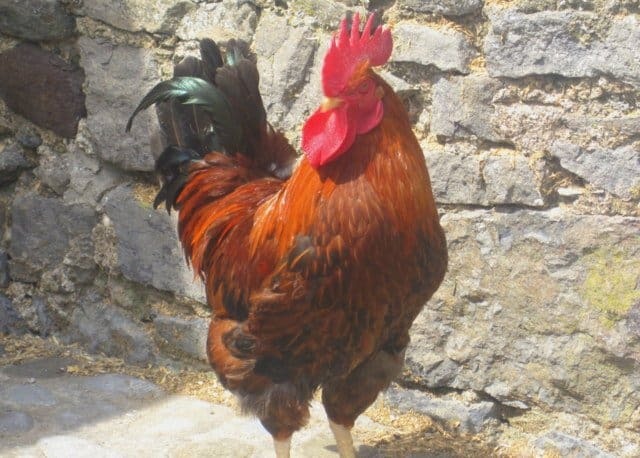 A hen-pecked man was always said to have been ruled by petticoat government. There probably was plenty “petticoat government” in my granny’s house, but really she was more of a wellington boot, than a petticoat kind of gal. 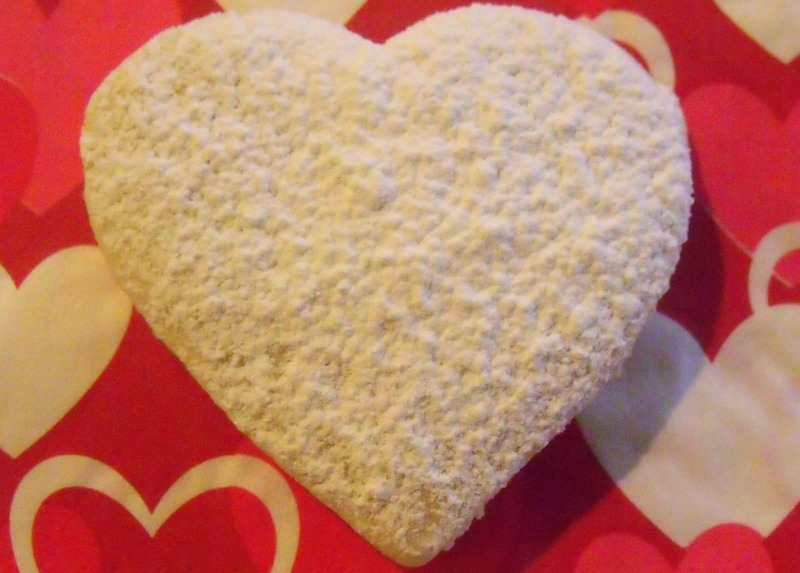 And so, after a little bit of petticoat history, it’s time for my Irish Shortbread Petticoat Tail recipe ….. 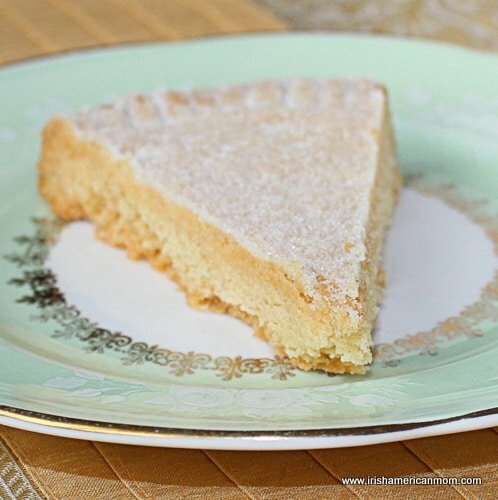 Traditional Scottish shortbread recipes use caster sugar and no corn starch. I like to use a little confectioner’s sugar and corn starch for texture. I find it best when using American flour, which is not as soft as Irish flour. 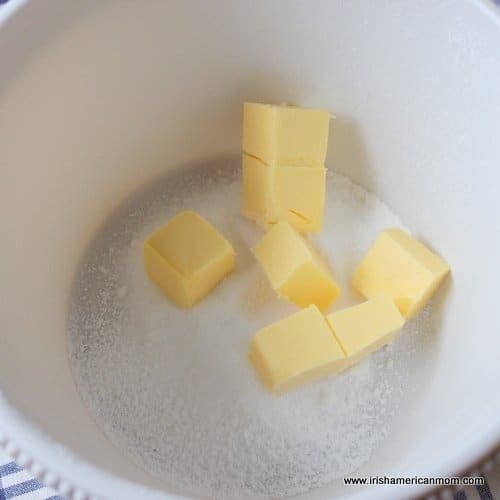 Sift the confectioner’s sugar into a mixing bowl, add the caster sugar and butter, together with the salt. 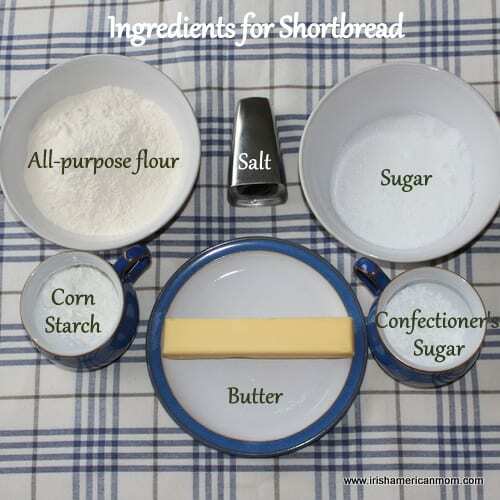 For most baking recipes salt is added with the flour, but I find it best to add the salt to the butter for shortbread. Only 1/8 of a teaspoon is required for this recipe and creaming it with the butter makes sure this miniscule amount is spread evenly throughout the dough. 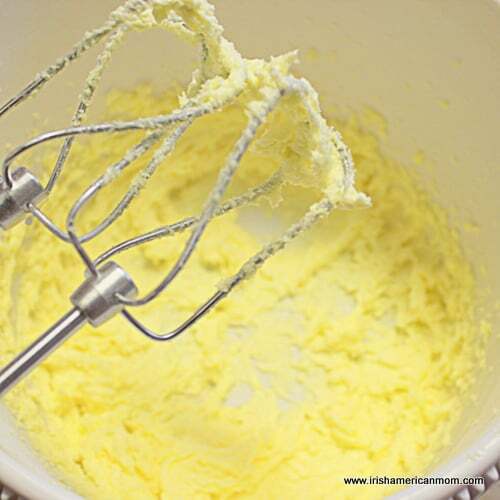 Use an electric mixer to cream the butter and sugars together until light and fluffy. This step takes quite a few minutes. The butter should be a few shades lighter by the time it is ready. Sift the flour and corn starch together. Next add half the flour and blend it in to the butter mixture. Add the remainder of the flour use your hand to form a soft dough. This dough will be very brittle and crumbly. Use your fingers to press the dough into a 7-inch round spring form pan. 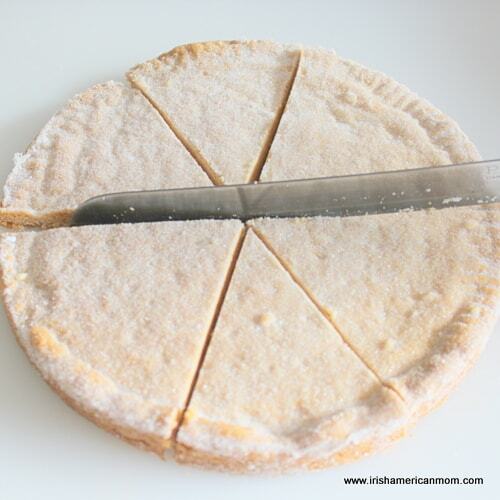 To flatten the upper surface of the shortbread, I remove the sides of the spring form pan and press the top with a rolling pin. Now don’t roll the top of the dough because it will roll over the edges and you won’t be able to replace the sides of the pan. Now it’s time to get creative with your petticoat tail pattern. I use a fork to imprint a light pattern all around the edge of the dough. You can create pastry frills if you wish, but I find that much easier to do with shortcrust pastry for a pie or tart. This dough is so soft and buttery I find fork marks are the easiest. 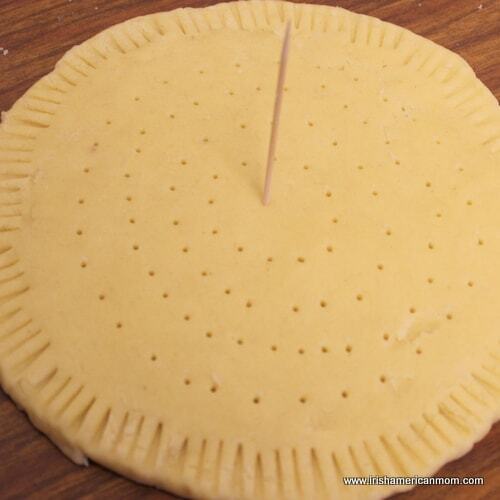 Then I use a tooth pick to indent the dough in circular patterns. 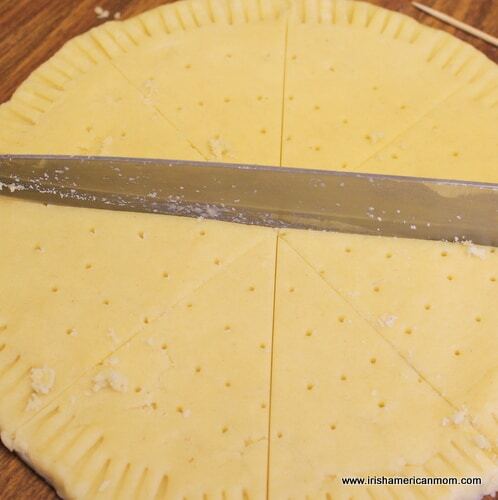 The final step before baking requires using a knife to divide the dough into eight triangles, leaving cutting guidelines on the shortbread. Next replace the sides of the spring form pan. Cook in a 300 degree Fahrenheit oven for 20 minutes, then reduce the heat to 275 degrees Fahrenheit for a further 15 minutes. When baked the surface will be a light golden brown. 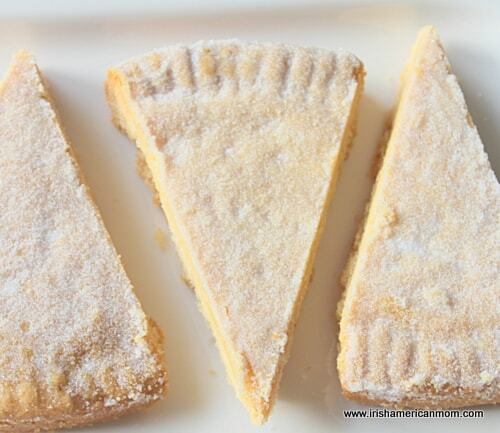 Sprinkle one tablespoon of sugar over the top of the warm shortbread, shaking the pan to spread it evenly. Cool completely before serving. Shortbread is just lovely with a hot cup of tea. Rich and buttery it’s a perfect accompaniment for afternoon tea. 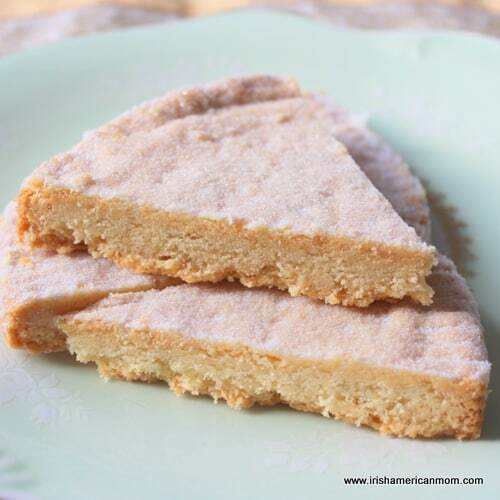 And don’t forget shortbread is a perfect base for many desserts. Wishing everyone happy Christmas baking days. Shortbread is a favorite cookie or biscuit in the British Isles, and is made with simple ingredients - butter, sugar and flour. Step 1 Pre-heat the oven to 300 degrees Fahrenheit. 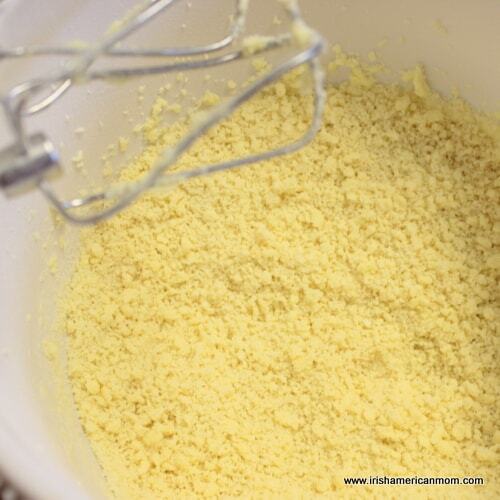 Cream the butter, sugars and salt together using an electric mixer until light and fluffy. Step 2 Sieve the corn starch and flour together. 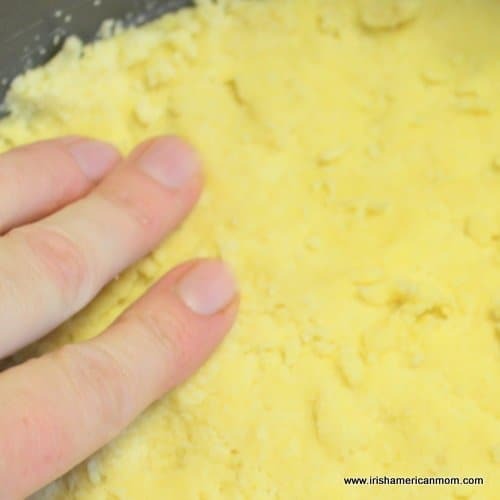 Add to the butter mixture and combine to form a soft dough. Step 3 Press into a 7-inch round spring form pan. 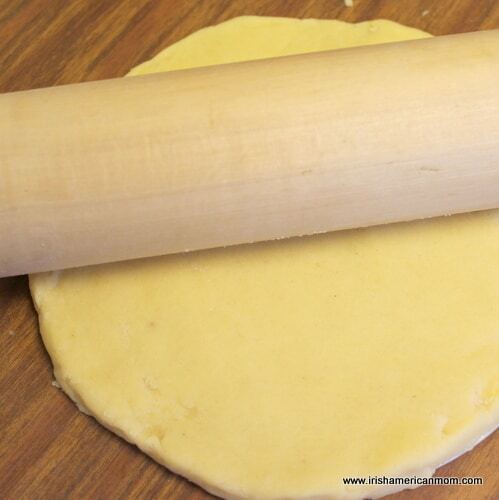 Remove the sides of the pan and use a rolling pin to lightly press the top surface of the dough flat. Use a fork to impress the outer edge of the dough. Prick the surface in evenly spaced circles using a tooth pick. Using a knife indent the dough in 8 equal triangular sections. Step 4 Replace the sides of the spring form pan. Bake in a 300 degree Fahrenheit oven for 20 minutes. Reduce the heat to 275 degrees and bake for another 15 minutes. I think I know what I will be making this weekend! Thanks for another great recipe , but also for the interesting petticoat details. I love the back story you include with everything, it is one of the reasons I love your blog so much. And the fact that it is connected to one of my favorite places in the world makes it that much better! Paticia – I’m so glad you enjoy my ramblings and stories. A straight forward recipe is never as good as one with a little background history. Stories from the past and about how things have come to be always stir my imagination. 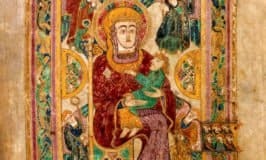 It’s lovely to be able to share them here on my blog. Another fantastic recipe. Thank you and I love the history about Dublin castle and the petticoat mirrors. Brighid – The information about the petticoat mirrors at Dublin Castle intrigued me on my tour there a few years back. I’m sorry I didn’t photograph them. It’s only since I started blogging that I have come to wish I had taken so many more photos during my younger years. 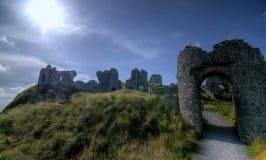 Can’t you just pictures the ladies dining at the castle checking out how their skirts were lying in the floor level mirrors. An ankle on view was deemed inappropriate back then – if they could only see what some young girls deem appropriate today! One of my favorite cookies to bake!! I can’t wait to try your recipe! I love shortbread too, Aimee – so rich and buttery. Looks Delicious, I must bake these when I am off for the Christmas holidays, they world be great with a cup of tea. They’re a perfect partner to a cup of tea. Thanks for checking out my recipe. Debra – Regular butter works fine – I use salted butter. 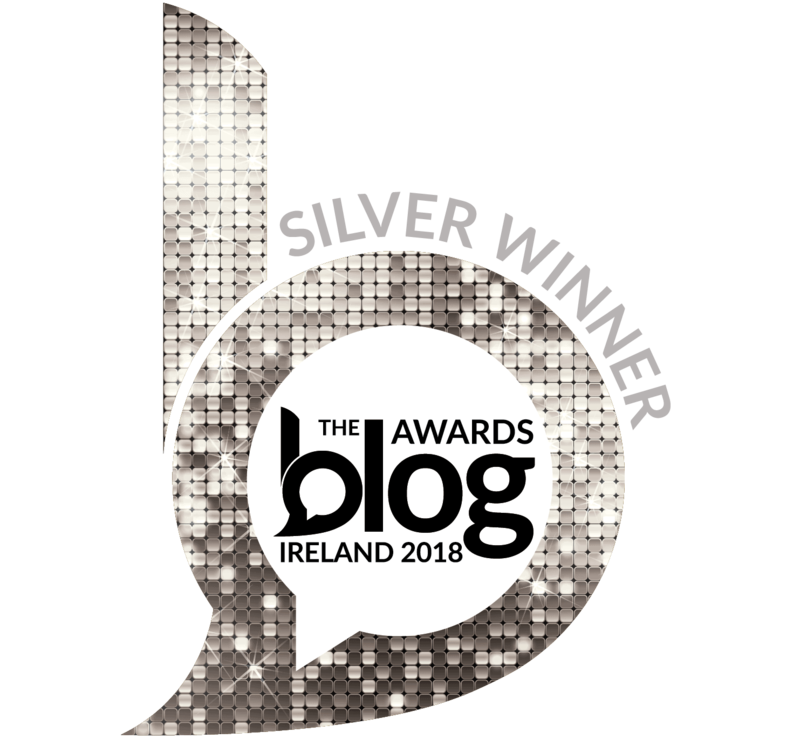 However, I get best results when I use Kerrygold Irish butter – I may be biased, but it is creamier than American butter, and wonderful for baking. Debra, I live in a relatively small town kind of place, but sometimes, especially closer to St. Patricks day, the chain supermarkets will carry Kerrygold products: butter, cheeses and my favorite, herbed butter! 🙂 Keep looking! Patricia – Thanks for this advice. It amazes me how many places are now stocking Kerrygold in the US. Hi Debra – I get Kerrygold in Trader Joes, and Kroger stock it also in Kentucky, but I’m not sure if those stores are anywhere near you upstate NY. I used to love Wegman’s grocery store in Corning, so I just did a quick check online and they do stock Kerrygold. You can check the different store locations online to see which ones have it in stock. American butter will make good shortbread, but if you can find Kerrygold I think you’ll have a slightly nicer, more authentic flavor. It’s more than twenty years since I’ve been to Elmira – a beautiful part of the world. Hope your winter won’t be too cold and snowy this year. Thanks for this great tip on caster sugar. I find American sugar is pretty fine, much finer than the beet sugar we had as children growing up in Ireland. Jo – Thanks for reading my recipes and ramblings and for your kind words. I laughed when I read you think the Irish sort of took over the East Coast – it’s so true. Debra – I visited Watkins Glen a few times when I was in Elmira. The park and waterfall are spectacular. There was a swimming pool there too we spent time at during the hot summer months. You live in a cold but scenic part of New York. Take care, and happy baking. Okay, now I know why the recipe didn’t work when I tried it! I forgot the corn starch! 😛 It was still good without it. Crystal – It’s only a very small amount of corn starch but it does help for texture. Glad you enjoyed this shortbread even without the corn starch. This shortbread is delicious! Perfect with a cup of tea. Thank you for the recipe! Keep them coming ! Dianna – Thanks so much for your feedback about this recipe. It’s lovely to get a seal of approval from readers. I’ve lots more recipes to share in 2015. Deirdre – It’ll last up to 10 days in an airtight container. You can freeze it too and it will last up to 2 months.